The US National Parks are quite remarkable places to visit. As I spent 2 weeks travelling two of the national parks - Yosemite and The Grand Canyon; driving some 3000 miles (4500km) with a good friend and fellow photographer: Prof Horolographer. I am also starting this series of articles to document this trip, but also as a tribute to the late great Ansel Adams who inspired me with his images, as he did thousands of others. As a self taught photographer, I had "discovered" Adams in a book at the National Library some 25 years ago, and learnt quite a bit on visualization, equipment, etc. The book was called "The Camera". But, as recently as a couple of years ago, I started to be interested in landscapes and cityscapes. I had more than a fleeting, but on and off, interest in large format photography. I do admit, sometimes the view camera, with its almost infinite adjustments that had intrigued me almost as much as its promise of ultimate quality. That led me to stumble on another photographic hero: QT Loung at Terra Galleria. His blog found on his site is full of interesting snipets on how he made his beautiful photographs. In the spirit of sharing that Adams and Loung had ably led, I also decided to make this series of articles a teaching series, to show how I made the photographs. I begin with Yosemite. Yosemite is a landscape carved over millions of years by glaziers and water. Leaving the peaks of granite standing proud over the valley floor. One of the many entrances into the National Park is via the Wawona Tunnel...and as one drives through the darkness of the tunnel, suddenly one is confronted with magnificence. A good friend of mine, who lives in Palo Alto highly recommended we try and get some pictures from this popular vantage point. We visited the lookout point twice. Once, immediately arriving to Yosemite. It was mid-afternoon when we first got there. The place was crowded. Full of photographers and busloads of tourists. But as it was full daylight in late summer (we were actually a few days away from official Autumn), the light was not flattering, and the valley had a misty haze. I was told the Rangers practice controlled burning, and one such fire was somewhere near Bridalveil Falls, not too far away. I shot a few photographs, but as I had suspected, the light was unflattering, and decided against showing them. 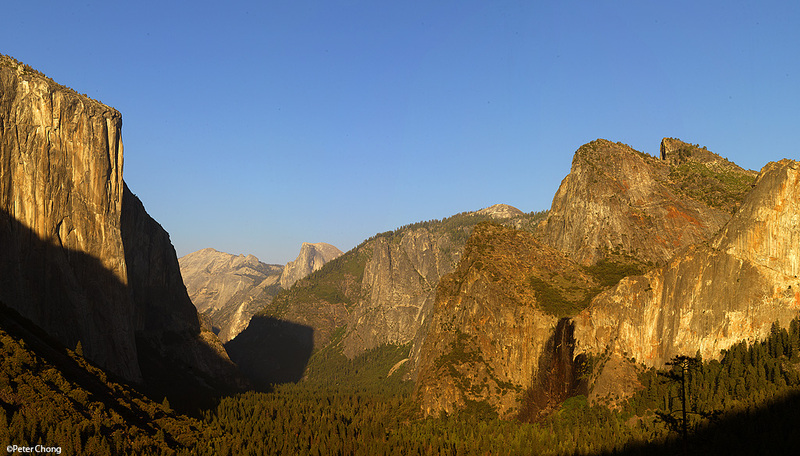 We returned to Tunnel View Lookpoint on our last day at Yosemite, arriving just before sunset. Again, the place was full of tourists and other photographers...ranging from point and shoot cameras trying to take in the vast landscape. It amuses me that due to the failing light, and automatic nature of such devices, caused the flash to go off...in its own attempt to illuminate the grand landscape. But in our midst were also serious photographers. 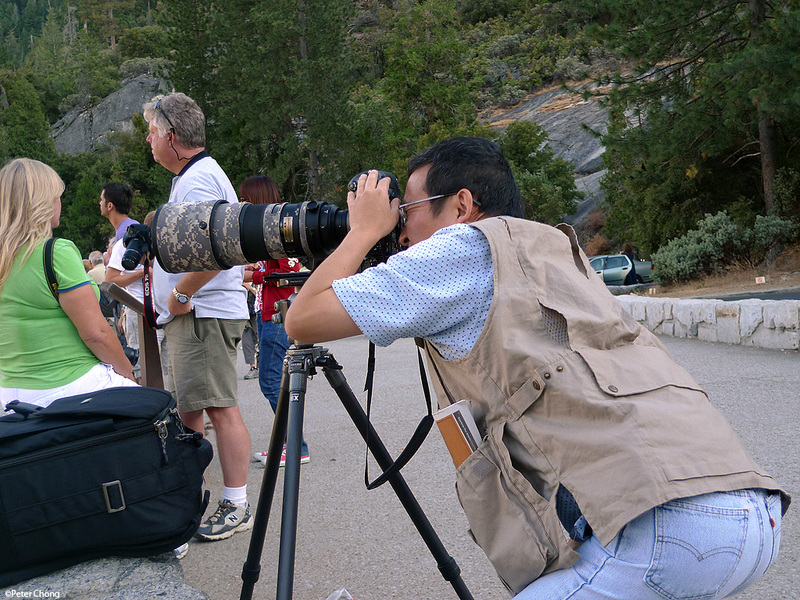 I spied one such character, with his Nikon D3, and long lens on his Gitzo tripod, peering deep into the valley. The entire valley can be viewed from this vantage point. These peaks...the nearer and to the left is El Capitan 7,569 ft (2,307 m) above sea level, and some 3000 ft (910m) above the valley floor of Yosemite. And in the far center, Half Dome, some 8836 ft (2693m) of sheer granite. Slightly right, the last remainding whispers of water falling down Bridal Viel Falls can be seen. Click on image for a larger 1920 wide image. The light was extraordinary. The rays of the setting sun had bathed El Capitan and Cathederal Rocks in a warm, golden glow, but Half Dome in the far background was lighted in a different light...more blue, as they were more East, and the sun's rays have just passed sunset there, plunging it in the near full moon's light. I wanted to capture the variable nature of this light, so the framing was settled...it had to be wide enough to cover El Capitan and Cathederal Rocks at the sides. I also wanted to include some of the trees at the valley floor...a la Adams in his winter exposure at probably the same spot. The Hasselblad HC4/28, which is a 28mm lens (approx 21mm in full frame 35mm) would cover this ground. I made a few photographs with this lens, but I also wanted to slightly compress the perspective from El Capitan and Half Moon, so I selected the Hasselblad HC4.120 Makro. This was a slight telephoto lens, with excellent near field ability, but also superb till infinity. The 120mm is approximately 91mm in 35mm full frame parlance, and had tremendous resolving power. In order to cover the framing requirements, I resorted to making a 3 panel stitch. This light phenomena is a fleeting moment, lasting no more than minutes, and the photographer has to be ready, tripod in place, to shoot this as it happens. A few minutes later, and the entire landscape would be bathed in the bluish light which now envelopes Half Dome. In preparation, I had earlier looked up the moonrise and sunset times on the internet, and we planned to arrive about an hour before actual sunset. It would have been even more perfect if the moon had appeared behind Half Moon, but such was not to be, as the moon at that time was to the right of the frame, just behind Cathederal Rocks. From another vantage point - Glazier Point, it would have been visible, but Glazier Point was a bit behind Cathederal Rocks from this perspective, and from that point, El Capitan would not be visible. I spot metered, placing El Capitan at Zone 8 (using Ansel Adams Zone System as a guide). This placed Half Dome in far center at about Zone 6, and shadows on the foreground of El Capitan Zone 1. I locked the exposure, and and shot 3 images in manual exposure mode as a panorama. And stitched the panels in Photoshop CS4. The lens was turned on its entrance pupil, which eliminates parallex errors. As with the MBS images earlier, these stitched images are very large. This particular one measures 11388 pixels x 6491 pixels, printed full resolution at 300dpi, will measure some 40 inches wide, and 20 inches tall. Typically, images can be up-rezzed to double the full dimensions, so a 80inx40in photo is possible with no loss of resolution or clarity. Due to the exceptional resolution of the 39 Mpx back and the 120mm lens, the detail captured is astounding. Prints of this and other images are available as fine art prints. Please contact me for details.